Setting a decoy spread properly is more than just choosing the right shape. Paying attention to the details like where to put your snows, blues, and headed decoys can really add to your success. I will assume for now that you have chosen a general shape on how you want to set your decoy spread. Once you have done this attraction and realism come into play. I will break each one down seperatly and why each is important. You must attract the geese first before realism matters! From a distance a snow goose flock and your decoys look like blobs of white. As the geese get closer the blobs turn into smaller blobs and the blue geese start to show up. As the birds get closer and lower they begin to see the details on individual snow geese. Details like heads on birds or decoys. Maximize Attraction and Finish More Geese! 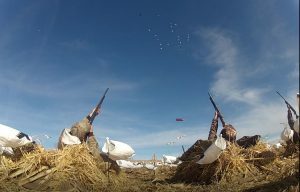 Snow goose hunters can maximize the attraction power of there spread by making it look as big as possible (so the geese can see it from as far away or high as possible) and packing the realism of your spread where it counts. 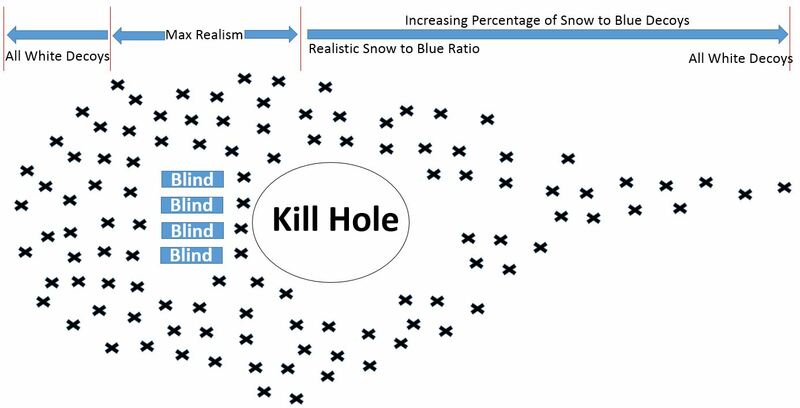 I do this by setting a spread built for attraction at a distance and realism near the kill hole. By using this type of setup no matter what your spread shape you will atttract and finish more snow geese!